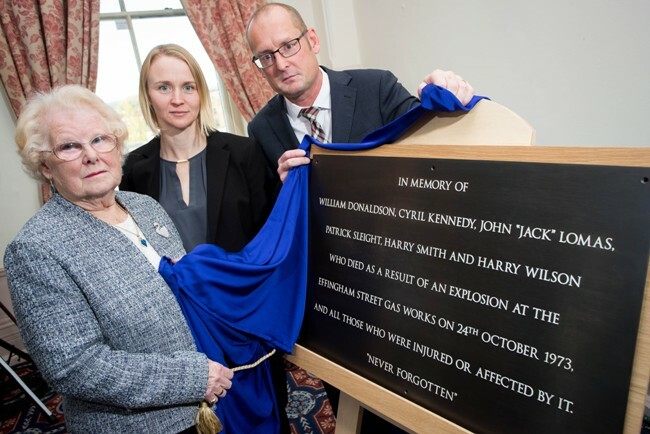 National Grid has unveiled a permanent memorial to those who died and were affected by an explosion 45 years ago, which saw six men lose their lives and scores injured. On the October 24, 1973, there was an explosion in a disused petroleum tank at the then East Midlands Gas Board works in Effingham Street, Sheffield. Forty five years to the day Jean Taylor, from the Retired Employees Association, unveiled a memorial plaque at an event held at the Royal Victoria Holiday Inn attended by relatives of those who died or who were affected by the explosion. National Grid has recently started work to dismantle the last remaining gasholder in an area that has been associated with gas production and storage since the early 1800s. Hannah White, land regeneration manager at National Grid, said: “We are grateful that so many relatives who were personally affected by the explosion chose to get in touch with us and were able to attend. We also had people who helped in the rescue efforts including fire and police officers. The six men who died were William Donaldson, Cyril Kennedy, John Lomas, Patrick Sleight, Harry Smith and Harry Wilson. The memorial plaque has been permanently sited next to the existing war memorial within the Effingham Street site.